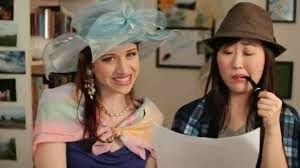 Some time ago the Austenesque world was abuzz with something new – a series of YouTube videos telling an updated version of Jane Austen’s Pride & Prejudice. I was sceptical, but I started on episode 1 and had a marathon watch-a-thon until I’d caught up. 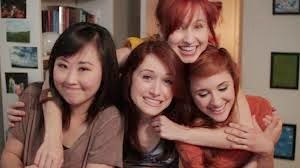 The Lizzie Bennet Diaries (or LBD, as many people shorted it to) moved the Bennets to modern-day California. The family consists of lovely sweet Jane, our somewhat snarky heroine Lizzie and the energetic younger sister Lydia. Lizzie is studying mass communications for her masters degree and is making a video diary as part of her degree. Like thousands of others, I tuned in twice a week for a 5-ish minute video with an insanely catchy theme tune, and caught up with a snippet of Lizzie’s life. I thought this was such a clever series. It’s one thing doing a modern update; I’ve read plenty of those, but this also had to work within some limitations. Firstly, the perspective is quite limited – these are Lizzie’s videos and very much seen through her filter. Secondly, the videos were being posted online from the outset, which some people know, and others find out throughout the course of the videos. Some characters we don’t see in person, and Lizzie does some ‘costume theatre’ to play their roles, which I found really funny, particularly her interpretation of her mother, complete with hat. There was also content in other platforms, such as twitter accounts of the characters that you could follow etc. Although obviously modernised, the main story points of Pride & Prejudice were all identifiable in the events the videos report. When I heard there was a book of the LBD I wondered if it would bring anything new to the table, or whether it’d be the same as the videos but just in book form. The events of the videos are obviously discussed, but the book gave a bit of a fuller picture of things, and because it’s a private journal rather than a public video there are also some things which weren’t included in the vlog. The videos are very much from Lizzie’s point of view but there is very often somebody else on screen, so their views can come across too. In a journal everything is solely through Lizzy’s filter, which as we know, can be faulty. For me, the aspect that changed most from the story Pride & Prejudice, which comes across particularly well in the videos, was the character of Lydia. She was a much more developed character than most Lydias in modernised versions. She’s a real party girl as you’d expect, but she takes her sisters’ opinions of her more to heart than they realise. She is loud, energetic and brash – but she is also funny, loving and observant and generally pretty adorable, if a little manic! She is quite lonely too, and is absolutely ripe for manipulation by George Wickham. He is completely ruthless here, and the majority of the blame for the event representing Lydia’s elopement in P&P lies with George. He is worse than Wickham in P&P in my eyes, as this George purposely intends to harm Lydia, which is a crime I would acquit original Wickham of, although his actions were obviously reprehensible. Lydia’s reaction to the event is very different to Pride & Prejudice’s Lydia too. This Lydia shows genuine remorse which goes a long way to securing your goodwill towards her, if you didn’t already love her. Mr Bennet is represented via costume theatre in the vlog, but he makes appearances in Lizzie’s diary and his reaction to the Mr Collins situation renewed my appreciation for one aspect of the original Mr Bennet’s personality – the fact that he doesn’t try to force his daughter into marriage and actively discourages her from a match that will make her miserable. Here, the marriage offer is instead a job offer that would see Lizzy have to give up her degree in its final year. It would be desirable from a financial perspective as the Bennets are undergoing financial difficulties and Lizzie would no longer need to rely on her parents. LBD Mr Bennet’s support reminded me that, just as in Pride & Prejudice, Mr Bennet may not have done all the financial things as he should have but he doesn’t intend that his daughters should pay the price while he’s still able to prevent it. Mrs Bennet was my favourite of all the costume theatre moments in the videos. Lizzie’s renditions of a southern belle who is determined to get her girls married off and popping out grandchildren were some of the funniest moments. 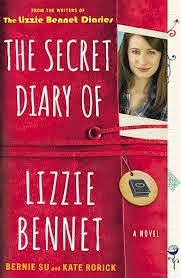 In the book I felt her character was developed further by Lizzie’s diary entries. She is painted in an embarrassing but very affectionate light. In fact, the whole family has a bond that really comes across well. Mr Collins is also reimagined from his Pride & Prejudice counterpart – rather than an unctuous sycophant he is here quite a sweet man, although he is still verbose and pompous. I got pretty fond of Ricky Collins, and you never expect to get fond of Mr Collins in Pride & Prejudice updates! What about our beloved hero? Well, this would be my only real downside to this book, lack of Darcy time. At first Lizzie talks about the public reaction to Darcy’s portrayal on her videos but very little about him. Because the diary is so much more from her perspective and he is not important to her, he doesn’t get much page time. In Pride & Prejudice the narrator tells us that Darcy is interested in Lizzy, but since the narrator here is Lizzie, who has no clue, some things aren’t so obvious. Later, when Lizzie meets up with Darcy at his company I was hoping we’d get some of her feelings on the situation, since this is her personal diary, but it was glossed over pretty quickly. Her change in sentiment isn’t there in much depth at all, which seems an unusual choice as this is a diary. I would definitely have been interested to read that. There is also very little on Darcy at the end of the story; I’d have liked to have seen more of them together as a couple in the book. I thoroughly enjoyed this book. The dialogue was often very amusing and was very identifiable as Lizzie’s voice from her videos. I thought it was an excellent enhancement to the original series. If you were thinking of getting the book and not watching the series I don’t think you’d be getting the full impact. Jane’s sweetness, Lydia’s excitable puppy quality and particularly things like the costume theatre have to be seen to be appreciated fully! The good news is that the videos, which have since won an Emmy Award, are available on YouTube so all you need to do is make the time to go and watch them! For those people who’ve already watched the videos there are couple of new videos to celebrate the release of the book so make sure you catch those! My thanks to Netgalley and the publishers for providing me with the ARC of this book for review. The videos are fun. There are a lot of them but they are each pretty short. If you watch them, try to watch Lydia's videos too, it makes the whole Lydia/Wickham thing more compelling. 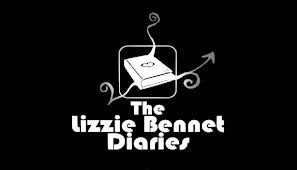 There is a DVD version of the Lizzie Bennet Diaries which was available to people who preordered but I don't know if it's available for sale through the normal retailers. It is good to see Lizzie's relationships with her sisters and Charlotte but I do like to have some Darcy time. In the series you don't get masses of Darcy time but it was enough. I felt from the more private viewpoint of her personal diary that there should have been more Darcy in the book, and not just because I am greedy (although I am)! I remember feeling the same way about BJD the book, I saw the movie lots of times before I ever read the book and when I read the book I was disappointed to see how little Bridget wrote of or thought about Mark Darcy. That never occurred to me, that Mark Darcy is not in the book that much, but I read the book before seeing the film. Perhaps it's preferable to read/watch in the order things were created. I think this book would be best read after watching the series.